I’d been looking forward to visiting Barbecoa for months. I love southern USA style BBQ food, the menu online seemed like a posh Southern Eleven, one of my favourite Manchester restaurants. I also love Jamie Oliver and Barbecoa is his collaboration with American BBQ expert Adam Perry Lang so I had extremely high expectations. 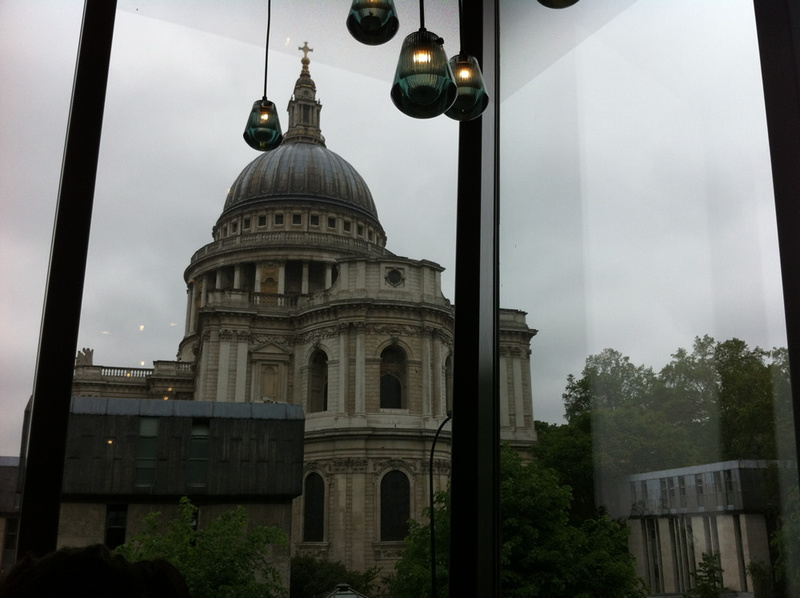 We arrived on a very wet London afternoon and were seated with a great view of St Pauls Cathedral, one of London’s most famous landmarks. 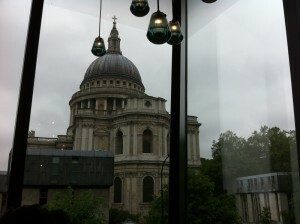 The photo is the view fron our table which I was pretty impressed by. The interior is as impressive as the views, modern and stylish with lots of wood panels and a large wine display. The only problem was that we weren’t massively hungry as we’d not long since had our breakfast, schoolboy error indeed. 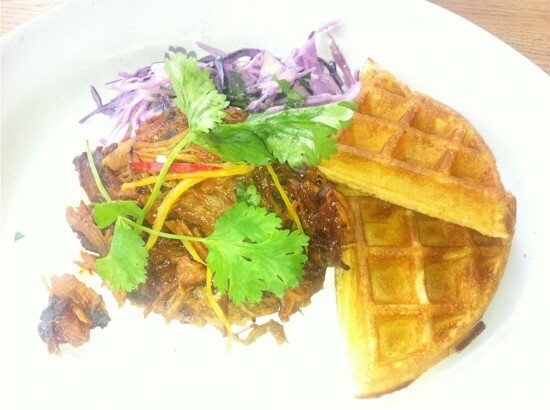 I knew that I had to try the pulled pork & waffle main course as the pulled pork at Southern Eleven is fantastic and serving it with a waffle seemed genius. Southern Eleven’s pulled pork has been responsible for a few food comas though so we decided to keep the starters quite light. 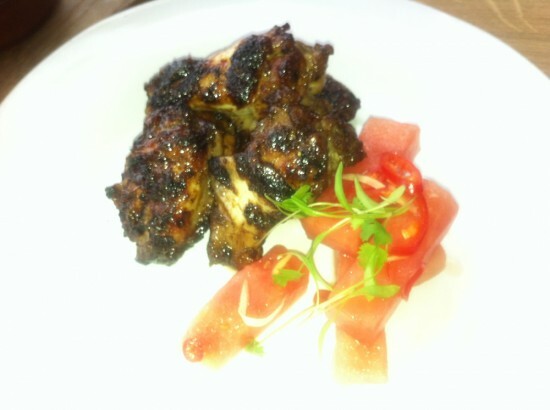 We went for ‘Amazing Pickled Vegetables’ and ‘Bourbon Chicken Wings, Watermelon, Ginger, Chilli & Coriander’. 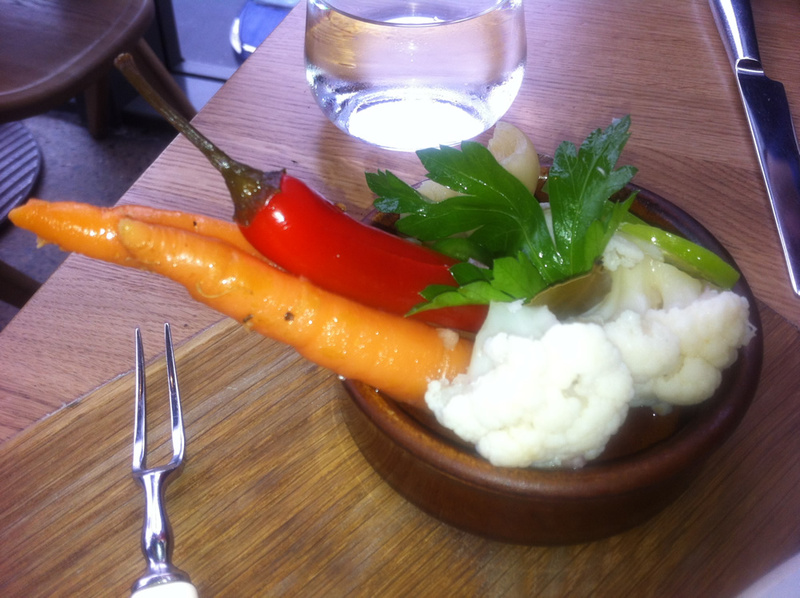 I wouldn’t call the pickled vegetables ‘amazing’ but they were very nice. I’m quite fond of pickled chillies but these were the best i’d ever had. The other veg was good to including cauliflower and especially the carrots which i’ve never tried pickled before but hope I do again. Even the parsley was pickled. The wings were excellent, chargrilled and sticky on the outside but juicy and moist on the inside and incredibly tasty. The watermelon & chilli garnish was a good companion. Our main courses arrived and my first impression was that it looked very pretty but was very small. I’d changed my mind after about 10 minutes though, the amount of pork was very deceiving. The pork was perfectly tender and the BBQ sauce was nice but slightly too sweet for my taste but my partner disagreed and loved it. The waffle was unbelievably light and fluffy and was obviously very recently freshly made. The red cabbage slaw brought a lightness and freshness that it needed with all that pork & BBQ sauce. We both struggled to finish but just about managed. What we didn’t manage was to order a dessert, despite some of them sounding and looking amazing there was no way we would have managed them so decided to be sensible for once. Despite not being able to eat as much as i’d like or drink much alcohol (I had a 4 hour trip home straight after) I had a good time at Barbecoa and hope to go back for a full evening soon.